Years ago I wrote a response to the election of Barack Obama in which I referred to him as “pro-abortion”. Some people wrote back to tell me that I was hateful for calling him this or that I was wrong; they claimed that he is pro-choice, not pro-abortion. Some even said that he is pro-life and wants to do everything he can to reduce abortions. 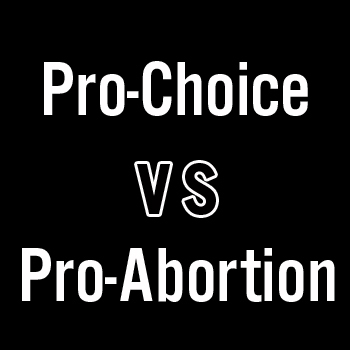 Before I get into what his agenda is and why I stand by my words about his position, I want to tackle the pro-abortion or pro-choice argument or “rhetoric”, which is what this really is about. The rhetoric war has been won for the most part by what I call the pro-abortion movement. They have themselves adopted the term pro-choice because it sounds a lot nicer than pro-abortion. I have often wondered why they have not changed another term that they use to describe themselves, “abortion rights advocates”. If they are pro-choice and not pro-abortion then why not refer to themselves as “choice rights advocates”? Let’s break down the words and examine what they mean. “Pro” obviously means that you are in support of something. Pro-gun, pro-gay rights, pro-life, pro-union; these are all terms that describe something you support. Why is it then that the term pro-abortion is not used proudly? The term “pro-choice” should really embody all of the “pro” stances on every issue; it shouldn’t just define one issue. When someone refers to themselves as pro-choice, what choice are they referring to? Abortion. So what they are saying is that they believe it is fine for someone to obtain an abortion, which makes them pro-abortion. If you believe people have the right to form and join unions even if you would never join one, you are pro-union. Would you be angry that someone referred to you as pro-union? Would you say I just believe in the choice to join a union, but I am not pro-union? Of course not. The use of the word choice shows that it is all about the stigma of being called pro-abortion; is there a stigma if there is nothing wrong with abortion? Why would people be so opposed to being referred to as pro-abortion if abortion is perfectly acceptable? To answer that we have to determine what abortion is. Is abortion simply the termination of a pregnancy? Is abortion just a medical procedure that removes unwanted cell masses from your body, like liposuction? The answer to those questions is a resounding no. Abortion is the termination of a pregnancy, but what is a pregnancy? The Random House dictionary definition of pregnant reads: having a child or other offspring developing in the body; with child or young, as a woman or female mammal. The Cambridge Dictionary reads: of a woman and some female animals having young developing inside the womb. Abortion is the termination or killing of a developing human person in the early stages of their life. It is that simple. We can try and sanitize it with words or phrases but that does not change what it is. There are a lot of things that are unpleasant that people or organizations try to make less appalling by changing the words used to describe them. As a parent I am guilty of this myself. When my children need to defecate I do not use that term; I say “go potty”. Does this change the fact that they are defecating? No, it just makes it sound less gross and nasty. That is why the pro-abortion movement wants to be referred to as pro-choice, not pro-abortion; abortion carries a stigma that they don’t want to be identified with. The difference is that there is nothing wrong with defecating; it is natural and how our bodies were created to work. There is, however, something wrong with abortion; it is un-natural and destroys one of the natural functions of a woman’s body. We should not give into the sanitization of abortion; it needs to be exposed for what it is. We should not allow rhetoric to define how we describe an evil like the killing of innocent human persons. I have often heard people say that they would love to see abortion reduced or minimized. Why? If there is nothing immoral or wrong about abortion then why would we care how many people had them? Why would we want to reduce something that is perfectly ok? If you want to reduce them then you must think there is something wrong with them; what is it that is wrong? This is one of the ways that Barack Obama has tried to characterize himself to people. He tries to sound like he is not the pro-abortion advocate that he really is. His own words and record contradict that; what he will do as President will be dangerous and devastating to this nation and the world. This week we have already heard that he will be reversing lifesaving Executive Orders that will result in the destruction of human life worldwide. He plans to reverse the Mexico City Policy which blocks the US Government from giving money to organizations who provide abortion in other countries. We will be paying for abortions overseas with our tax dollars. He will open up the funding of destruction of human embryos for research paid for with your tax dollars. This is just the beginning of the destruction of human life that has been and will continue to be championed by Barack Obama. During the primary season he spoke at a Planned Parenthood event and promised them that he one of the first things he would do as President is sign the FOCA bill into law. The Freedom of Choice Act will wipe out all restrictions on abortion in this country. There will be no more parental notification, no restrictions whatsoever including the Partial Birth Abortion Ban and an increase in federal funding of abortion. How can you say you want to reduce abortions, and wipe out every restriction there is, and fund abortion in the US and other countries with US tax dollars? The pro-life movement and, more importantly, the sanctity of human life will be set back over 30 years once Barack Obama takes the Office of President. I have been told that speaking negatively about the President is hateful and disrespectful. I have been told that I need to support our new President and just pray for him. I agree that we need to pray for him, and pray hard. I however disagree that pointing out the truth of what he plans to do, and has promised to do is hateful in any way. I would even argue that silence would be hateful; apathy and acceptance of his plans would be disrespectful to those whose lives are in jeopardy. I know that God is still on the throne and He is sovereign. I know that God is not worried, panicking or hiding in a corner in fear. I know that He is still our King and our only hope is in His Son, Jesus. I also know that He commands us to “ love our neighbor as ourselves ” (Luke 10:27). When our neighbors are dying by the thousands every day in this nation, we have an obligation to stand up and fight for their lives. God calls us to “ rescue those being led away to death; hold back those staggering toward slaughter ” (Proverbs 24:11). I will not cheapen the sanctity of life or sanitize the pro-abortion movement by using the term pro-choice. I will not sit quietly by as my brothers and sisters are being slaughtered in abortion mills every day. I will pray for, but not support, our President as he opens the floodgates and destroys all regulations and restrictions against the killing of innocent children. Killing a human being is wrong. Abortion is killing a human being. To say you are pro-choice but not pro-abortion, is simply illogical.